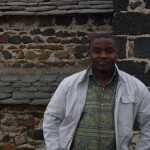 Charles M. Mupenda (DRC) has recently finished his masters degree in Theory and Practice of Human Rights at the Catholic University of Lyon, France. He fulfilled an internship position at the International Labor Organization in Geneva, Switzerland, until recently, and has experience as a lawyer in his home country, the Democratic Republic of Congo. He is eager to take the knowledge and skills obtained during his studies, along with the $5000 JusticeMakers fellowship, and return to his country to begin implementing his project. Charles’s project aims to defend detainees who live with HIV/AIDS and who are imprisoned at the Kavumu prison. A prison is located in a remote area. One of the problems that Charles identifies is lawyers’ limited access to this area, as they typically live in urban areas and poorly-constructed roads are an obstacle rather than a means when trying to access those remote locations. An aspect of his project that Charles is particularly enthusiastic about, is his approach to financial sustainability. With his secured fellowship, he will start a commercial taxi service. The taxi will ensure that funds are raised throughout, and even after the project term ends. In addition, the taxi will allow different stakeholders to travel between the prison and the urban areas.